Now, there are more worthy cocktail bars than I can visit on a regular basis. And I’m seeing additions that wouldn’t have been considered four years ago such as bars not only stocking but also showcasing spirits like gin. The Renaissance Paris Le Parc Trocadero Hotel has recently undergone a remodel and unveiled the first and only self-proclaimed gin bar in Paris. Of course I had to check it out. The hotel reopened its doors last April after 4 months of renovation that resulted in the award of a fifth star. On entering the lobby bar, one does feel as if it’s just been revamped. It’s clean, modern and non-fussy but still manages to flirt with a bit of fun. Cheeky green armchairs and shiny surfaces offset more traditional paintings and low-key sofas. As with many hotel bars, lighting is bright. But, those looking for something more relaxed or romantic can move to the lovely leafy courtyard terrace year-round with its heat lamps and charming ambience. Prices range from 14 to 16 Euros. The standard cocktail menu features four classics based on a range of spirits and a suggested alternative for each. The classic dry martini has a recommended variation of the cucumber gin martini (Hendrick’s, cucumber juice and lemon juice.) I think this is a fun idea but I only got it from paying close attention to the cocktail list. I wonder if the regular costumer would even notice and might need more of a “If you like this, try this…” approach on the menu. Next up are the ‘signature drinks’ which all feature French gins (either G’Vine, Citadelle or Magellan.) Teacher’s pet seems to be the Flower Power @ le Parc (jasmine infused G’Vine Flourison, Saint Germain, rose syrup and lemon.) Once again, I don’t know if this is intentional but the name is very similar to the already established Flower Power cocktail from Simon Difford (also gin and St Germain based). In short, it’s a good start for a gin bar. However if I were really angling to corner the mothers’ ruin market, I’d put more gin-based drinks on the menu. But, the staff tells me there are plans to expand both the menu and the gin selection. It should be noted that bar manager, Axel Ginepro, was not in-house when I made my visit and I think that fact made some of the teething pains more evident. over dishes of truffled cashews. 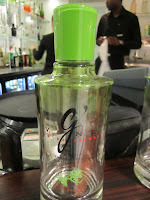 But from an admittedly attentive customer’s perspective: if you’re going to call yourself a gin bar, step up! Notwithstanding, I do think this an interesting and exciting project. But in order to capitalize on that, more staff training and expansion are in order. Otherwise, it’s just a nice hotel bar with excellent service that just happens to have a lot of gin on hand. I get it. We all have to start somewhere. And, just as hopefully both this blog and the Paris cocktail scene have grown into something more substantial with time, so will le Parc’s gin bar.